With "the environment is our livelihood" as one of its company values, Northstar-at-Tahoe Resort continues to step up its efforts to help preserve and protect the environment. It is implementating a comprehensive Habitat Management Plan for the entire 8,000 acres of resort property, LEED certified development, and a continued effort to encourage guests to use resort provided or mass transportation to get to and around the resort. Northstar Resort was the first California ski area to partner with the Bonneville Environmental Foundation to offer guests an opportunity to purchase mini-green tags to help offset their carbon footprint with renewable energy. "We've always been believers that our resort operations and any development that takes place at the resort needs to be implemented in a way that is environmentally responsible," said Tim Silva, general manager of Northstar-at-Tahoe Resort. The Northstar-at-Tahoe Resort Habitat Management Plan (HMP) was developed in cooperation with Sierra Watch, the Mountain Area Preservation Foundation, Northstar-at-Tahoe Resort and East West Partners in an effort to balance resort land uses with natural resources. The goal of this plan is to maintain and enhance the values of late seral habitat forests, aquatic, riparian and meadow habitats while providing for operations of a four-season resort. The HMP establishes a large Habitat Conservation Area at the resort that is managed to maintain and enhance wildlife habitat, open space and low intensity, non-mechanized recreational use. Northstar Resort has subsidized internal and external transportation services for more than 10 years, providing multiple routes to and from the resort, and encouraging employees and resort guests to use public transportation. During the 2007-08 winter season, the resort provided complimentary transportation to more than 832,156 passengers including employees and resort guests. New this season, Northstar Resort has introduced an online Rideshare program designed to help guests and employees coordinate a carpool to the resort. Whether someone needs or can provide a ride, the program is designed to connect people who can travel to the resort together, reducing the number of cars on the road and allowing them to save gas and money. Those interested in using this program can do so online at http://rideshare.northstarattahoe.com . 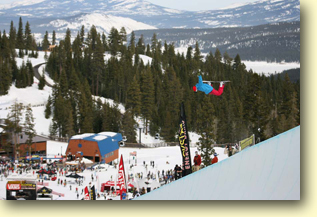 The Bay Area Ski Bus, NAC Ski Club and other shuttle services also bring guests to the resort from several Bay Area locations, Sacramento and Reno. Northstar Resort offers discounted lift tickets coupled with transportation by each of these companies, as well as helps to promote the usage of these services to resort guests. Northstar Resort and its development partners have adhered to green building policies in the recent development at the resort. The entire Village at Northstar project was constructed using the Leadership in Energy and Environmental Design (LEED) guidelines and has received LEED certification, making it the first ski resort village development to be entirely LEED certified. In addition to this, the Ritz-Carlton Highlands project and the Northstar Lodge, Hyatt Residence Club are also being developed adhering to LEED guidelines. Through recycling programs and the use of new technology, Northstar Resort has diverted approximately 255 tons of material from the landfill over the past 11 years. As a result of its efforts, the resort has been the recipient of the California Waste Reduction Awards Program (WRAP) award for 12 consecutive years. Northstar Resort will continue to expand upon its work to preserve and protect the environment and encourages day and overnight guests to join in the effort to find ways to reduce their individual and collective carbon footprints when coming to and staying at the resort, offering suggestions about What You Can Do. A complete list of the environmental initiatives currently in place at Northstar Resort can be found online at www.NorthstarAtTahoe.com/environment . Northstar-at-Tahoe Resort is located on Highway 267, just six miles north of Lake Tahoe and six miles south of downtown Truckee. For more information, call 1.800.GO.NORTH (1.800.466.6784) or visit www.NorthstarAtTahoe.com .